"All the wonderful flavors of the famous soup served as a slaw. I like to serve it over a bed of baby greens, but you can also just serve it as a side salad." 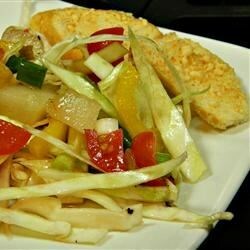 In a bowl, mix the cabbage, cucumber, tomato, yellow bell pepper, green onions, and celery. In a separate bowl, whisk together the tomato-vegetable juice cocktail, red wine vinegar, sugar, olive oil, salsa, and lemon juice. Season with salt and pepper. Pour the dressing over the vegetables, and toss to coat. Cover, and refrigerate 2 hours before serving. I really liked this slaw but found it a bit acidic. I used Picante-V8 for more zing. Will make this again but cut back on the vinegar.